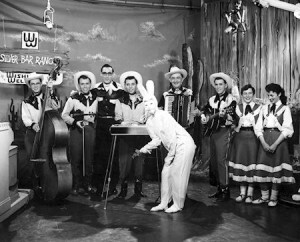 The Silver Bar Ranch show was one of the first shows produced at CKCO in 1954 and hit the air every Saturday evening from 7-7.30. The Band Manger was Mr George Matheson from Princeton. He drove a big Caddy at the time and did all of the bands bookings. Our sponsor was Kitchener Beverages who distributed Wishing Well Orange and Pepsi. On the side of our set they had a big wishing well filled with bottles of Wishing Well Orange. Johnny Siska was the band leader, Earl Fries guitar and later with the Chaparrals and now retired. Mike Slauenwhite who played fiddle and also sang. He also played for the Kitchener symphony. Wally Becker played stand up bass (since passed) and last, but not least, the Fries sisters who sang in harmony on the show and the dances. They were very popular. Oh I forgot to mention 13-year-old Bob Tremblay. I played triple neck steel for the group and for the first year I had to be transported to Kitchener from Guelph and picked up in the middle of the night. 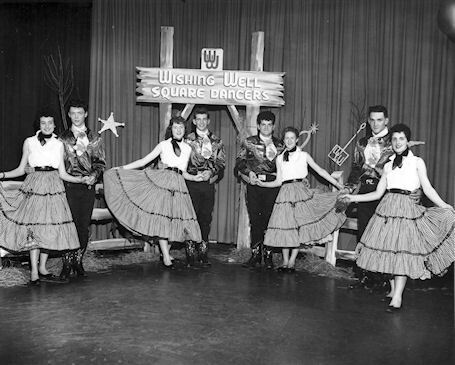 I had only been with the group for a couple of dances before having to do a TV show. I remember I was scared and a month later in Oct. I turned 14. The following year I was allowed to drive my parents car because at the time if you had your parents consent in writing you could go down to the police station and show proof and get your licence. The Silver Bar Ranch show was one of the first shows produced at CKCO in 1954 and hit the air every Saturday evening from 7-7.30. The Band Ma nger was Mr George Matheson from Princeton. He drove a big Caddy at the time and did all of the bands bookings. Our sponsor was Kitchener Beverages who distributed Wishing Well Orange and Pepsi. On the side of our set they had a big wishing well filled with bottles of Wishing Well Orange. Special thanks to Bob Tremblay for his photos and his recollections.